If you are using the same system from a long time then you may face some issues such as unexpected slowdowns, sudden system crashes, error messages etc. But have you ever tried to find out the reason behind this unexpected behavior? Turns out, you can boost up your system by yourself by cleaning junk files in Windows. First let us find out what are junk files and where do they come from. Junk or temporary files are those which are created on the system because you have opened a webpage or a document which creates/saves it on your system. Although these files were momentarily important for your system, they end up lying uselessly, thus taking up extra space on the hard drive. Here are some easy tips to find and remove junk files from your computer. Use disk cleanup: It is Windows in built utility which can be used to clean junk files. You can access disk clean up by right clicking on the drive for which you want to perform clean up and going to Properties. You will see Disk cleanup button on General tab. Next wizard will show you a warning message and ask if you would like to delete temporary files permanently. Proceed further and the given partition will be cleaned up. You can follow the same procedure to clean each drive but you will find that only C drive is heavily loaded with junk files. Another thing which can be done to clean junk files in Windows is to clearing browser history and cache. To clear browsing history you can access settings given on the browser. In most of the popular browsers history clearing wizard can be launched by pressing Ctrl+Shift+Del. If you are using the same browser from a long time, then you should clear browsing history and to delete temporary files from the beginning time it spare lots of space on your hard drive. Apart from this you can also clear the downloads folder on your computer to clean junk files in Windows. This folder may have files which you have downloaded for one time use or the files which you have already copied to other location. 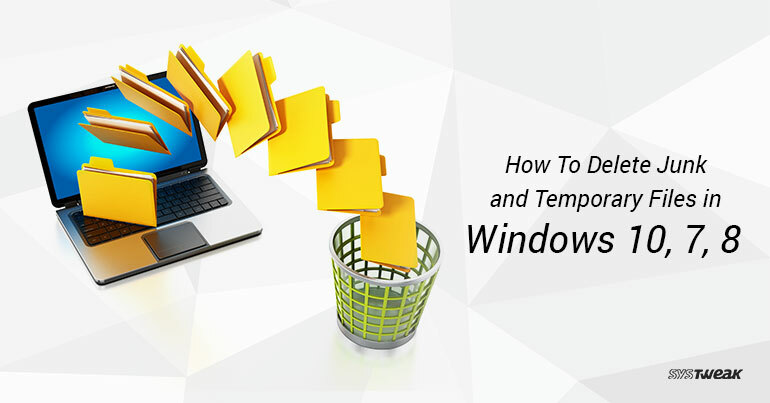 This is how you can remove junk files or temporary files easily from your computer. It not only helps in making more free space on the computer but it also helps in boosting up system speed.